The one thing the geniuses at PA and the MTA will not do is add trackage and extend service. Instead they build these H.R. Giger-esque monuments to themselves. How about spending $4B toward the SAS? The argument that the money could have been spent on something else always appeared to be a Straw Man to me: the PA is interested in this thing as an asset that supposedly generates revenue. THAT, more so than the oft reported figure (which I’ve begun to feel, more and more, is a bit misleading) is the real concern. Will it – and the new Fulton Center and Brookfield Place – even function adequately as a shopping destination? If the answer is yes, I care very little since it will pay for itself, over time. If the answer is no, then I’ll be angry. People carry on as if, had 9-11 never happened, or if only the PATH platforms and concourses were rebuilt, the PA would have spent $4 billion on something else. I doubt, very strongly, that that is the case. The obstacle to the authority increasing capacity and enhancing service isn’t some “boondoggle”, but their own unwillingness to do so – except when one of the governors asks nicely (see: Newark and LGA). Fulton Center has a bunch of space that is meant for retail, and a Shake Shack is supposed to come into one of the spaces. But the Fulton Center has been open for 2 years and not even a pop up shop has filled any of the spaces. That’s lost revenue to the MTA that they can never get back. The MTA is hardly alone on leaving money on the table. The PANY is at least working through Westfield to get the mall built, and they’re competing with Brookfield, which completely revamped the WFC to bring in new high end stores. Before 9/11, the WTC mall was one of the most profitable in the nation on a SF basis. It could again be a major revenue maker for the owners, but the cost to build out a transit hub that didn’t add any capacity was unconscionable. At every opportunity to rein in the costs, the decision was made to continue down this path. Interesting take & I do agree. Lets not forget the national psychy after 9/11. I’ve mentioned this before on here… the mood was WE MUST REBUILD after a symbol of freedom was destroyed & there wasn’t going to be any expense spared. There wasn’t as much thought put into transit capacity since this was a national vanity project & not a mobility enhancer. If this were a transit project of the first order, there would have been a lot of questions raised on design & cost even if the money was spent anyway. The national mood” on 9/11 was psychotically delusional. The “national mood” had had a coup less than a year previously with the Presidency stolen by rogue elements on the Supreme Court, and the “national mood” had let the usurper get away with it. The “national mood” proceeded to allow the usurper to invade Iraq just because he felt like it, based on a pack of lies. While the country which generated almost all of the 9/11 hijackers — Saudi Arabia — was given almost total support by the usurper. I think the “national mood” should have been ignored as soon as people came to their senses. Good enough, but lets not forget the medias roll in that national mood including but not limited to the cable news networks & there mouthpieces who didn’t ask a single important question regarding this. Proof that the delusions still persist! The problem is that much of the country still believes the lies. Gary, look up the nationality of the 9/11 hijackers and how Bush treated Saudi Arabia. It’s blatant. Bush II was a Wilsonian, just a label change of the Beltway duopoly. His save-the-world dilettante war campaign has the distinction of being even more maladroit than LBJ’s, but at least in Bush’s case, we were responding to a real attack. As mentioned above we ‘retaliated’ by ignoring the attacker, KSA. Gore would have been different, but not better. Sounds like Gary has been spending too much time on http://www.infowars.com or something similar. That might be one of the strangest claims you’ve ever made. Of course Gore would have been better. Gore may not have been ideologically that different from Bush on domestic policy, but he was capable of discerning the difference between reality and fantasy. I know that people who pretend to care about fiscal responsibility usually don’t actually care, but Gore would not have blown 13 figures in pointless military expenditures, and Gore would not have created a power vacuum in that region for ISIS to step into. It’s of course entirely possible that Gore would have lost in 2004 to a neo-con and much of the same crap would have happened. It’s kind of funny how delusional people still think Al Gore claimed he invented the Internet. Don’t say propaganda doesn’t work. Yeah. Gore actually said that, as a Congressman, he pushed through the funding for the invention of the Internet. Which is *true* — the inventors of the Internet, such as Vint Cerf, have explicitly said that Al Gore’s work in Congress is what paid for their work inventing the Internet. The World Wide Web maybe. Other internet protocols such as Telnet were already active in the 1970s and 1980s. Before the Web. He encouraged funding telecommunications infrastructure. He said nothing about inventing it. You prompt a good question, and that is just how many (high end) shopping malls can lower Manhattan support? Isn’t this all some government fantasy that they can create all this rent revenue and sales tax revenue when in fact this just won’t happen? It may appear that way, but don’t forget the astounding number of world travelers who visit NYC every year. There was a mall there that made lots of money. Has anyone put together a good public accounting for the $4 billion pricetag? Is there enough detail in the Port Authority financial statements? I tried…interestingly, my suspicions seem close: the budget for the actual transit hub has been conflated with (or, depending on one’s perspective, extricated from) other facilities. On page 37 in the 2014-2023 Capital Plan Summary, the Transportation Hub is only budget as $938,736,000. However, if you add in the “WTC Retail Development” – which as indicated, includes the joint venture with Westfield – and the “WTC Site Common Infrastructure and Memorial”, that figure comes to $3.9 billion, which, I might add, is almost the same figure I came up with when summing the capital expenditures on the Hub reported in their 2006-2016 budgets. hmmm, actually, it seems the first reference is for years 2014-2018, so I guess the comparison doesn’t make sense. They’ve been awfully coy with the true breakdown of expenditures on this thing. They’ve never provided me with sufficient detail when I’ve FOILed the records. I need to try again with a more focused question. For that 4 billion price tag the path could have connected to the LIRR at Atlantic Ave. terminal and possibly turn off under the harbor to Staten Island. 4 billion for no increase or upgrade to transit, but instead something nice to look at. And even the “something nice to look at” part is debatable. I was at the WTC PATH station recently and quite honestly, while on the platform waiting for the train, I felt like I was in a hospital. Imagine if we’d spent the money on connecting PATH to the local tracks of the IRT Lexington Avenue line as was proposed after 9/11. You’d have a one seat ride from the east side of Manhattan to World Trade Center, Jersey City, and Newark. What a missed opportunity. Does this also mean that the supposed connections to the E and R trains will also in March? Or do we have to wait for the 1 train platform to be finished before those open? Wait a minute, hasn’t the Dey St. Passageway been open for quite some time now? The Dey St. Passageway connects the R to Fulton St. The other underground connectors between the E and the WTC and the R and WTC aren’t open. Does anyone know when the connection between the Cortlandt St R to the WTC E will open? Or was that scrapped? Always seemed like a quick and potentially useful transfer for folks on the 8th Ave local. I’ve never been able to find out if there will be a restored ramp entrance to the southbound R train from the WTC shopping concourse. Not sure about that connection, but they should have built a street entrance to the south-bound R Cortlandt St platforms at the southern end of the station in the vicinity of Liberty/Church St near the SE corner of the new 4 WTC building. There used to be an entrance to the southbound R train at Liberty I believe. Does anyone know if there is a description of where the entrances will be? No one knows! We see what looks like temporary walls on the west end of the Dey passageway but also on the southbound R platform. There are blueprints, but they’re all PA blueprints. In all the time I was at FC, I never saw one drawing for what was going to be built west of that wall. BUT, isn’t the connection between the R and the WTC simply going to be when you can “keep going” walking westward, and walk from the end of the Dey St. Passageway into the underground part of the Calatrava center? Yes that is true. The question was whether or not that connection will also open in March when the Calatrava center opens. There will also be a connection to E train (and A/C via) from WTC to the Calatrava center and I was wondering if that too would open in March. In addition, there was originally planned an in-system transfer between the R, E (and A/C) and 1 trains via the Calatrava station, with the Dey St corridor being an out-of-system connection. I am not really sure how the in-system transfer would work though as the 1 and R platforms are at opposite ends of the Calatrava station and the E train platforms are 1 block north of the R platforms (with the construction site for 2 WTC in between). And the delays in getting the Calatrava oculus finished and opened means that the PANY can’t shut the temporary headhouse at Vesey and Greenwich, which means that demolition and rebuilding that area continues to be delayed (and that’s supposed to be the site of a cultural center). They were supposed to get alternative entrances to PATH open via 2WTC in the fall, but they missed those deadlines too. Some of that was apparently due to chasing after leaks in and around the facility. BTW, one of the reasons for the ongoing delays in getting the PATH station completely redone was the choices made at the outset – to build the temporary station without provisioning for the swift removal of those structures. Instead of building the temporary station and platforms so that they could be easily disassembled, it required major demolition work with heavy equipment. That slowed the pace of rebuilding, and added to the construction challenges. It seems that at every opportunity to streamline construction or reduce costs, the PANY chose the more expensive route (though the decision to build the WTC memorial in time for the 10th anniversary was a political one made by Pataki, so that cost ultimately can and should be blamed on him). 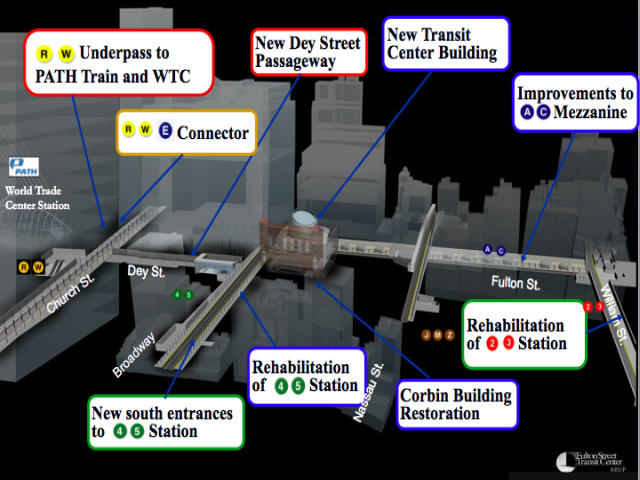 There was an outside chance that if no deal was struck to rebuild, the temporary WTC PATH station was going to remain as is. Except a deal was going to happen, whether it was 1 year or 10 years down the road since the PANY needed to get this done eventually. They knew that rebuilding would occur eventually. They just made no plans to do so expediently or efficiently. If they ever build a Hoboken-Atlantic Terminal commuter rail connection through Lower Manhatton, could Fulton and WTC Path be used as the headhouse(s) for that facility? The above ground oculus could work at either Fulton or WTC, but everything underground at track level would need to be scrapped. Currently, the PATH tracks loop around so you’d have to go through a slurry wall and change elevations to get a through track into Brooklyn via the WTC. That would be extraordinarily expensive and gut the existing facility. You’d need to run additional deep tunnels to have any chance of this decades from now. Following 9/11, I would have loved to see serious thought given to creating a transit hub in lower Manhattan that would have allowed for Metro North, LIRR, and NJ Transit to link up. There was a plan to bring LIRR into the area from Atlantic Terminal. The idea was killed as being too expensive. It’s almost a mockery that this “thing” is so expensive. The post had a writeup on the entire transit “rebirth” back in 2002. $70 mil for looking into the possibility of downtown LIRR. Probably spent on stationery. Amazing on the cost estimates on some of the proposals. I’d rather have the Cortlandt Street 1 back. At the rate it’s taking, it will be 17 years closed. Aside from being overly expensive – it’s ugly. I mean I even had relatives here this past week and they snap pictures of even the most mundane (to us New Yorkers) parts of the city because it’s exciting to them. Upon seeing this structure while visiting the WTC memorial – there reaction was “what is that?”… They didn’t take any pictures. Any news on the 1 train Cortlandt street station? How about NYC starts taking bids to demolish this thing and replace it with an office or residential tower on the site. No use throwing good money after bad. I wouldn’t be surprised if that is seriously discussed in 50 years. This does not seem to be something that will age well. For sure it will. Most buildings we find hideous eyesores today were considered attractive and often modern wonders when they were built. The idea that we just need to focus on beautiful design, ’cause unattractive structures were built without such attention to aesthetics, is a total con. Aesthetic tastes change! Right? Who’d want to take a dingy, old fashioned train into the city when you could ride in air-conditioned glory on a bus to the beautiful Port Authority terminal! PABT still seems popular with the automotive set. Most transit users and advocates see it for the shithole it is, a necessary evil at best, but politicians and drivers think it only needs to be made bigger. The main reason replacement is discussed at all is the structure has depreciated/deteriorated to the point where it literally can’t be sustained much longer. It’s not because buses are inefficient at moving that many people and rail would work better. But then, these are the people who almost never have to use it. PABT is pretty enough. The problem is that it seems to have been designed as a perfect pigeon coop, and is operated as a pigeon coop. To be fair, the original PABT looked quite nice. It was the 1970s X-shape truss redesign and the complete lack of interior renovations that turned it into an eyesore. So much transit opportunity was squandered with the rebuilding of Lower Manhattan. It was proven to be possible to connect the WTC PATH line and the Lex local, sending the 6 to New Jersey. While much of Lower Manhattan was a large ditch it would have been smart to take advantage of the situation and build new platforms for an RER-like line connection Hoboken to Brooklyn, and perhaps one from Grand Central, via Lower Manhattan, to Staten Island. Instead, all we have are two towers of stupid spending, which cost several billion dollars but added no new capacity. It’s a shame really, and hopefully NYC never gets as comprehensive an opportunity to rebuild an entire CBD’s infrastructure as we did in 2001.